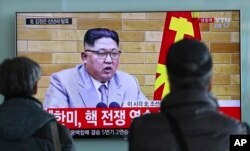 A man watches a TV broadcasting a news report on a high-level talks between the two Koreas at the truce village of Panmunjom, in Seoul, South Korea, Jan. 9, 2018. Senior North and South Korean officials are holding their first face-to-face talks in two years after a series of North Korean missile tests and belligerent warlike rhetoric from Pyongyang. "I think we should be engaged in these talks with an earnest, sincere manner to give a New Year's gift — precious results to the Korean nation," North Korean delegate Ri Son Gwon said, taking a much different tone. The talks are being held in Panmunjom — the so-called peace village straddling the border where the 1953 armistice that ended the fighting in the Korean War was signed. The two counties are still officially at war. President Donald Trump is calling Tuesday's talks "a big start" and says he hopes they go beyond a conversation about whether the North will be a part of next month's Winter Olympics. North Korean leader Kim Jong Un said in his New Year's Day message that he is willing to send a delegation to the Winter Games in South Korea, moments after boasting of a nuclear button on his desk that could fire a missile at the United States. FILE - South Koreans watch a TV news program showing North Korean leader Kim Jong Un's New Year's address, at the Seoul Railway Station in Seoul, South Korea, Jan. 1, 2018. South Korean President Moon Jae-in, who has sought better ties with the belligerent North, responded by offering talks with Kim's government. Tuesday's talks are widely expected to focus on the Olympics and whether athletes from the North and South can march jointly at the opening ceremonies. The U.S. has no part in the talks but is looking toward its close ally South Korea to possibly open the door to some kind of dialogue between Washington and the North Korean regime. "The sooner the Trump administration follows Moon's lead in opening a direct channel to Pyongyang, the better," professor John Delury of Yonsei University in Seoul writes in Foreign Affairs magazine. "Peacemaking efforts between the two Koreas alone are only part of the solution. But they could be an important catalyst and generate positive side effects, paving the way for the United States and North Korea to resume their own dialogue." As of this week, the chances of a North Korean-U.S. dialogue appear remote. Trump responded to Kim's remark of a nuclear button on his desk with a tweet that he has a "bigger and more powerful" button on his desk and that his works. FILE - A man walks by a TV screen showing a local news program reporting about North Korea's missile launch with an images of U.S. President Donald Trump and South Korean President Moon Jae-in at the Seoul Railway Station in Seoul, South Korea, Dec. 1, 2017. Secretary of State Rex Tillerson has not completely ruled out diplomacy with the North. He says Pyongyang would benefit as much as anyone in the Asia-Pacific region. But he says there cannot be any talks with North Korea until its denuclearization is "complete, verifiable, irreversible." The North is extremely unlikely to agree to this, no matter how heavy the sanctions get, just as the U.S. is not likely to agree to the North's demands to end annual large-scale joint war games with the South. Some analysts say the U.S. should simply accept North Korea into the family of nuclear-armed nations and work with China and Russia in keeping the North contained. But the U.S. views North Korea as an unstable, dirt-poor nation run by a dangerous dictator, with no clear way of knowing how he would lash out if he feels his regime is threatened, from within or without.